Acute elbow injuries occur suddenly and include fractures, tendon ruptures, dislocations, and ligament sprains. A radial head fracture is a break to the radius bone in the forearm just below the elbow joint and usually occurs as a result of a fall onto an outstretched hand. This elbow injury causes instant pain to the joint which would make it very hard to move the arm. There are different grades of this injury which affects how it is treated, read more on this below. Symptoms of a radial head fracture of the humerus include instant pain at the time of injury, which is located on the inside of the elbow joint. Immediate swelling with difficulty turning the arm over and pain when attempting to bend or straighten the elbow. Most radial head fractures are not displaced, meaning the fractured fragment of bone does not move away from the fracture site. This means they are easier to treat and do not usually require surgery. Radial head fractures are not always seen on early x-rays, although should be clear after 2-3 weeks rest. This injury is also associated with elbow dislocations – with 10% of dislocations involving a radial head fracture. Treatment depends on the presence and amount of displacement. A grade 1 injury with no displacement is initial immobilization with a removable splint followed by relatively early mobility exercises. When displacement is present, surgery may be required. If the fragment is one large piece, this involves fixing it back to the bone with pins or wires. When the fragment is broken into several smaller pieces, the surgeon may opt to remove them altogether. The olecranon is the large bony prominence at the back of the elbow on the ulna forearm bone. It is usually fractured from a direct impact or fall onto a bent elbow. Intense elbow pain, swelling, and tenderness at the back of the elbow are common symptoms of this injury. Sudden intense pain at the back of the elbow will be felt at the time of injury. The patient will in most cases be unable to straighten the elbow. Rapid swelling and bruising may start to appear. Trying to move the elbow will be painful and the back of the elbow will be very tender to touch. 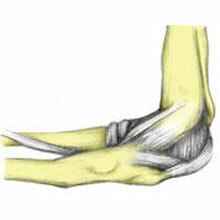 An Olecranon fracture can also occur due to a forceful contraction of the Triceps muscle which attaches to it. This may happen when falling onto an outstretched hand, with the elbow bent. X-rays will be used to determine the extent of displacement of the fractured bone segment. Pain medication and a sling may be used in the meantime. If the fragment is not displaced the elbow is immobilized in a splint or cast to allow healing. If the fragment is displaced, surgery may be performed to realign and fix the bone fragment. The coronoid process is a protrusion of bone on the Ulna, at the front end of the ‘cup’ in which the end of the humerus sits. This part is fractured through a fall onto a straightened elbow and is often associated with an elbow dislocation. Symptoms include pain, tenderness and swelling over the front of the elbow joint. Non-displaced fractures can be treated with immobilization in a cast for 3-4 weeks. Displaced bone fragments may require surgery. An intercondylar fracture is a break to the Humerus (upper arm) bone, between the medial and lateral condyles at the lower end of the bone. Fractures here are described as being Y or T shaped and have varying degrees of displacement of the fractured bone segment. This injury is usually caused by a blow to a flexed elbow. The patient will usually be holding their arm in a flexed position with the palm facing downwards. The forearm may appear shorter than the other one. Treatment usually involves surgery as the fragment is usually displaced. The two prominent parts of the Humerus on either side of the elbow are known as the Epicondyles (or just condyles). A condylar fracture is a break to one of these bones. The outer (lateral) condyle is more likely to fracture than the inner (medial) one. Injury to both is due to impacts or falls. 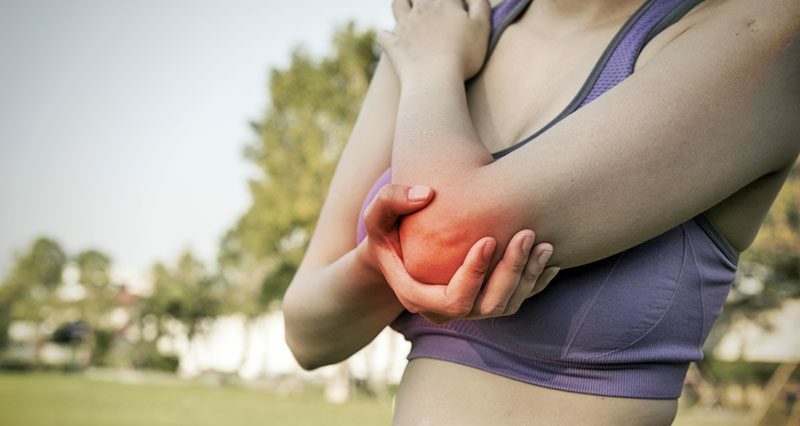 The patient complains of pain, swelling and a limited range of motion, It is common to feel a crunching feeling or sound when trying to bend the elbow. In non-displaced fractures immobilization in a cast or splint is sufficient. If the fragment has become displaced then surgery is required. The Capitellum is the rounded lower end of the Humerus, which articulates with the Radius of the forearm. Fractures to this area occur most often through a fall onto an outstretched hand. Symptoms include pain and swelling at the front of the elbow. Most fractures are displaced and so require surgical fixation. Elbow dislocations are the second most common dislocations in adults, behind the shoulder. The elbow is a very stable joint and so it requires a lot of force to dislocate it. Severe pain and obvious deformity are the common symptoms for this elbow injury, which is normally caused by a fall or direct impact. Symptoms include extreme pain with obvious deformity with bruising on the inside, and outside of the elbow. If a fractured or dislocated elbow is suspected then seek medical attention immediately. An elbow hyperextension injury occurs when the elbow is bent back the wrong way. This over-straightening causes damage to the ligaments and structures of the elbow. Like elbow injuries, this often occurs in contact sports like rugby and causes instant pain. Ice, compression, and taping are some of the ways this injury can be treated. This type of injury occurs most frequently in contact sports such as rugby or martial arts. There will be instant pain as the arm is forced straight. Pain will be felt at the front of the elbow and some swelling may appear. The biceps muscle may spasm to protect the joint, making it difficult to straighten the arm. Read more on Elbow hyperextension injury. The medial collateral ligament (MCL) of the elbow is situated on the inside of the elbow and helps to provide stability to the joint. A tear of this ligament can occur either as a sudden onset acute injury or as a chronic, gradual onset injury through overuse. Symptoms include pain and tenderness on the inside of the elbow. Bruising and swelling may be present for more severe injuries. Impact injuries causing damage to the medial ligament usually involves a lateral force (towards the outside) being applied to the forearm, placing the medial (inner) joint under stress. Overuse injuries of the MCL may also occur. Repetitive motions which place a lot of stress on the inner elbow can cause damage to the ligament. For example, throwers (track and field and ball sports such as baseball) are prone to this injury. Especially if the technique is poor! Treatment involves rest and applying the PRICE principles of ice, compression, and elevation – if caught early enough simply modifying the technique to avoid stressing the ligaments may be enough. However, full rest may be necessary. A professional may therapist may use ultrasound therapy or apply tape to protect the ligaments. Sports massage may be helpful, especially friction techniques to break down scar tissue and increase blood flow. Wearing elbow support may be helpful to aid heat retention, encourage blood flow and promote healing. Surgery may be performed to reconstruct the ligaments, however, this is a very last resort as results are not often good. A bruised elbow or elbow contusion usually occurs as a result of a fall or impact to the elbow. The elbow will appear bruised and will be tender to touch. Rest, ice and compression can usually treat this elbow injury, but it should be monitored for signs of more serious damage. 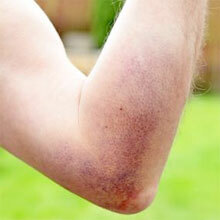 Bruised elbow symptoms result from a sudden pain on impact from a fall or fast-moving ball. Bruising and discoloration of the skin around the elbow gradually appear. The area will be tender to touch and there may be some swelling. Movement of the elbow may be mildly painful or limited. It is important to look out for symptoms which may indicate more serious damage at the elbow such as a fracture. Rest the arm. Sit with the arm elevated and use a compression bandage to reduce swelling and bleeding. Ice should also be applied to reduce bleeding and swelling. If the elbow is very painful, consider a fracture and seek medical attention. If a fracture is suspected an X-ray should be taken to confirm the diagnosis.